It's been several months since the Guardians last battled Pitch at the earth's core and neither hide or hair of him has been seen since. The village takes a vacation to the Lunar Lamadary where they learn of another Guardian with a painful history. The Guardians take their job of protecting children and each other very seriously and are great friends with each other. When trouble strikes, they rush to meet it. Their care for each other - particularly Nightlight's and Katherine's - is evident. Young Katherine shines especially in this story when she makes a game-changing decision based on something very important that the other Guardians have forgotten. Toothiana's backstory includes sacrifice, loving parents, caring friends, and virtue in the midst of the troubles that she faced. The greatest magic is in belief. "I believe" is chanted a couple times. Ombric is an Atlantean wizard with knowledge of spells; North is his apprentice. The powerful relics have magical properties. Nightlight and Pitch are more or less spirit-like. The Lunar Lamas are holy men who "study" the Man in the Moon; whether this is scholastic or religious is not said. The Spirit of the Forest restores North's old bandit band back from stone. A magical elephant ends up turning a man into a monkey. A monkey army is said to be part-monkey, part-man (man-like in mind, mostly) and consisting of the bad parts of both. Mother Nature makes an appearance. 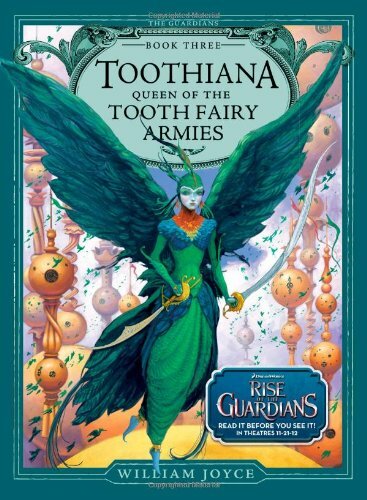 Toothiana herself is a result of a union between a man and a once-immortal winged woman; she also has the ability to divide into multiple miniature versions of herself. Bunnymund goes through a temporary bodily change. Fights between the forces of good and evil break out. Injuries are inflicted, but the only serious damage mentioned is a wounded wing and the implied deaths of two people (these deaths are part of Toothiana's past and so are told in story-form). Katherine falls from a cliff and is barely saved, but she knocks her chin and loses a tooth as a result. She is also kidnapped by monkeys who jostle her a good deal. This story deals a lot with hatred and revenge and the overcoming of these emotions to become a better man. Other themes include intense care and friendship, the love between parents and children, and the cherishing of memories. All in all, a good story with great morals and a lesser concentration of magic than the two books that came before. Note: "The Guardians of Childhood" novels are best read in chronological order as they build on each other; "Nicholas St. North" and "E. Aster Bunnymund" precede this story.